As posted on the Durham Region website, January 20, 2013. DURHAM -- Through Courtice Secondary School's recent Casual for a Cause campaign, staff raised $2,280 for Sleeping Children Around the World. The money bought 65 bed kits for children in developing countries. A Toronto-based organization, SCAW uses $35 donations to provide bed kits for children in 33 countries. Depending on local needs, the kits contain combinations of a mat or mattress, pillow, sheet, blanket, mosquito net, clothing and school supplies. Donors receive photographs of children receiving their kits or special occasion message. For more information, visit www.scaw.org. 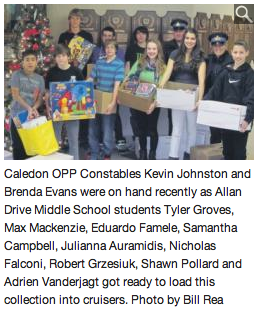 As posted in The Caledon Citizen, January 3, 2013. The holidays are always a time for giving, and there are many groups and organizations in the community that try to make sure the less fortunate are not left out. That was again the case throughout Caledon this year. 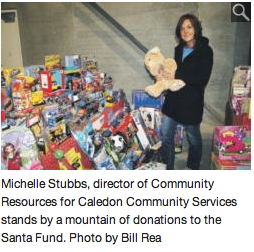 As usual, Caledon Community Services (CCS) ran its annual Santa Fund, collecting a vast assortment of toys, food and other contributions to local families that have been having trouble getting by. She added about 200 families were helped out, including roughly 300 children. For the fifth year in a row, Husky Injection Molding Systems announced it would match every single dollar donated to the CCS Santa Fund up to $25,000. Caledon OPP was the spirit too. The Saturday before Christmas saw 40 Caledon students taking the opportunity to spend time with a police officer shopping for Christmas gifts for their families. Police report each student was provided with a $100 gift card donated by local businesses and schools. They were given an hour to wander the aisles of Walmart in Bolton to make their purchaces. The shoppers were then paraded through Bolton by police cruisers, with lights and sirens blaring, to Robert F. Hall Secondary School. The hungry shoppers and officers were then served breakfast by the officers and staff at the school. 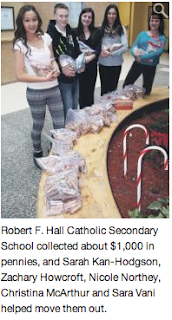 Robert F. Hall Catholic Secondary School collected about $1,000 in pennies, and Sarah Kan-Hodgson, Zachary Howcroft, Nicole Northey, Christina McArthur and Sara Vani helped move them out. 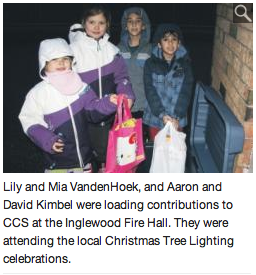 Lily and Mia VandenHoek, and Aaron and David Kimbel were loading contributions to CCS at the Inglewood Fire Hall. They were attending the local Christmas Tree Lighting celebrations. Most of the schools in town held charity projects of their own, and many of them contributed to CCS or Shop With A Cop. Alloa Public School Principial Tammy King said students and staff there conducted a food drive and mitten tree in support of CCS. As well, she said the school helped support a needy family through the Children’s Aid Society. Shawn Sabourin, principal at Credit View Public School, said they sponsored a disadvantaged family through the Share the Joy program at the Peel District School Board. He said each class designed its own gift basket, and then they were raffled off to raise the money. The school also held a food drive to support CCS and contributed to Shop With A Cop. Debbie Sutton, secretary at Belfountain Public School, reported the school took part in the Share the Joy program, supporting three families. Students at Caledon Central Public School raised $1,407 to help a family of eight through Share the Joy, according to Principal Lynn Bristoll, and that was one of several charitable projects the school was involved in. She added staff contributed to Shop With A Cop and there was a dance for intermediate students, with admission being a food item to go to CCS. As well, the school held a successful Penny Drive. “The penny is becoming extinct here,” she observed. These funds are being used to provide clean water in the Third World through RBC. Bristoll also said there had been sales of hand-made crafts, with proceeds going to support agricultural projects in Ecuador through Free the Children. “We are keeping busy, that’s for sure,” Bristoll said. 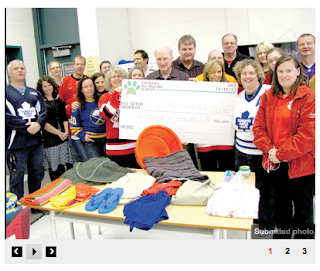 A mitten drive in support of CCS was one of the projects at Alton Public School, Principal Andrew Greenlaw reported. The school also held a food drive in support of the Salvation Army in Orangeville. Some of the efforts at Herb Campbell Public School were aimed at supporting Share the Joy. Office Manager Brenda Smith also said there was a Candy Cane Tree, from which kids got gift ideas for needy youngsters. There was a big food drive and Mitten Tree at Macville Public School in support of CCS, Office Manager Sharyn Holloway reported. She said there was a student dance, with a food item being the cost of admission. Palgrave Public School was again involved with OPP in cramming police cruisers with toys and food. Principal Laurie Johnson was expecting them to fill between two and three cars. Students at Allan Drive Middle School also filled some police cars. As well, Office Assistant Claudette Brown said they bought candygrams to give to each other, with proceeds going to the CF Foundation. The efforts at James Bolton Public School were aimed at supporting the breakfast program at another school in Peel. Principal Lisa Miller-Wood said any left over food items were to go to CCS. There was a 12-day food drive at Caledon East Public School, Principal Laurie Allison reported. She added staff adopted a family through Share the Joy. The local food drive received support from staff and students at Ellwood Memorial Public School in Bolton. Principal John Stegeman said the effort collected about 3,000 cans. In addition, he said the school continues to support Sleeping Children Around the World, and they raised enough to buy 70 bed kits for families in Africa. Holy Family Elementary School collected toys for CCS, Head Secretary Margaret Proctor reported. Pope John Paul II Elementary School held a food and toy drive for CCS. “The kids did a fantastic job,” declared Vice-Principal Maria Parker. She added the school helped out 31 kids at another area school. St. Cornelius Elementary School in Caledon East had a Giving Tree set up in the front foyer. Head Secretary Kerri Badger said it was filled with an assortment of hats, scarves and mitts. Students also worked on gift boxes. More than 150 of these boxes were collected and distributed through Dr. Andrew Simone’s Canadian Food For Children. St. John the Baptist Elementary School in Bolton also held a food and toy drive in support of CCS. Secretary Nadia Cavaliere also said shoe boxes of gift items were assembled at shipped all over the world through the Samaritan’s Purse. St. Nicholas Elementary School in Bolton held a food, toy and winter clothing drive in support of CCS, as well as the Society of Saint Vincent de Paul. Principal Eric Fischer praised the support of the community in making the drive a success. There were several projects at St. Michael Catholic Secondary School, Chaplain Urszula Cybulko reported. She said each department got two Christmas baskets to fill; one for a local family, and the other to go to a refugee family through Romero House, which assists refugee families in Toronto. As well, all the home rooms at the school were invited to contribute to the Chalice Program, in support of the Third World. “The whole idea was global and local outreach this Christmas,” she said. Things were busy at Robert F. Hall too. Chaplain Brenda Holtkamp said the school held a Sock Drive in support of the Good Shepherd Centre in Toronto. The effort raised more than 1,700 pairs of socks. As well, she said the school put together about 15 Christmas hampers for Romero House. They also collected some $1,000 in pennies to be distributed through RBC in Orangeville, and held a food drive in support of the Society of Saint Vincent de Paul. Both the Salvation Army and CCS have benefitted from the holiday charitable efforts of students at Mayfield Secondary School. Vice-Principal Gail Shotlander reported the holiday food drive at the school brought in some 5,700 items, which were sent to the Sally Ann in Brampton. She added the class collecting the most items were entitled to a pizza party, but they opted to have those funds directed to the food bank program being run by CCS.